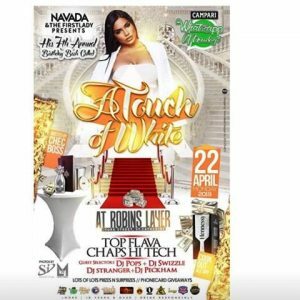 The shooting of two people at Linstead town in St Catherine is enough to spark outrage; so too is the brazen fashion in which the shooters unleashed terror on their target. 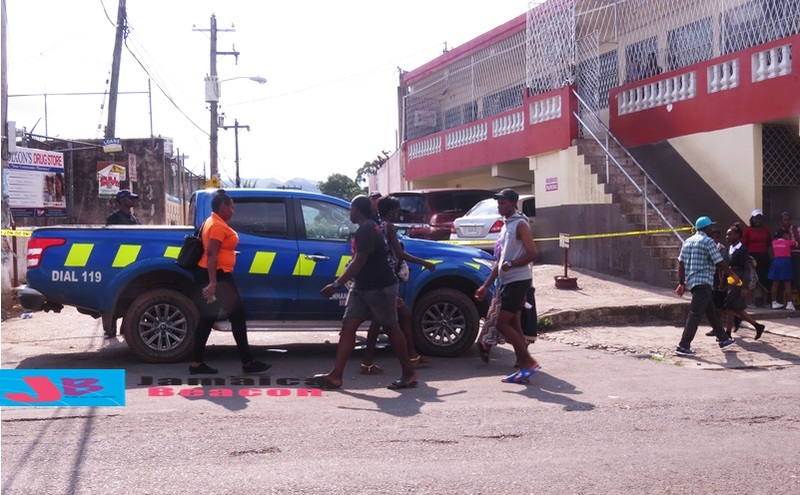 The gun attack transpired shortly after midday on Friday (April 12) on Fourth Street, which runs along the right fence of Sinclair’s Bargain Centre. It left a man and a schoolgirl in hospital nursing gunshot wounds. The man is said to be a law enforcer who was attired in plain clothes at the time he was shot. 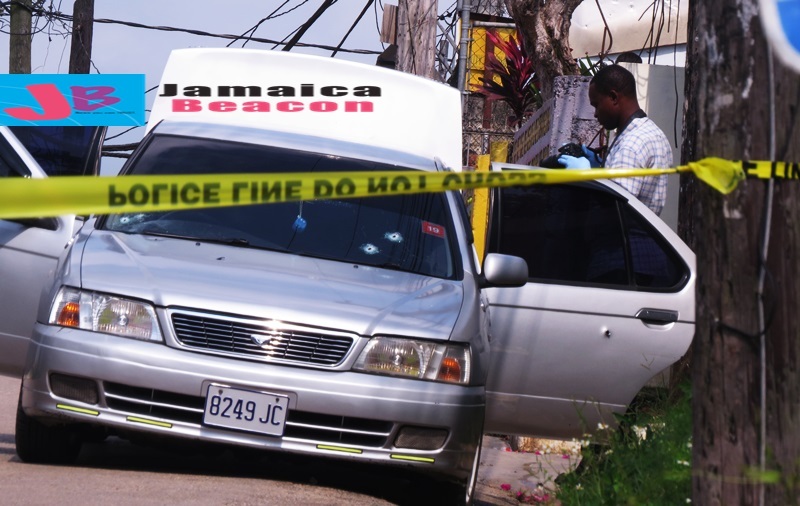 The Jamaica Constabulary Force (JCF) stated that, as was reported earlier by The Beacon, the male victim, at the time of the incident, was inside a car on Fourth Street. The car, pictured above, was left with a number of gunshot holes. 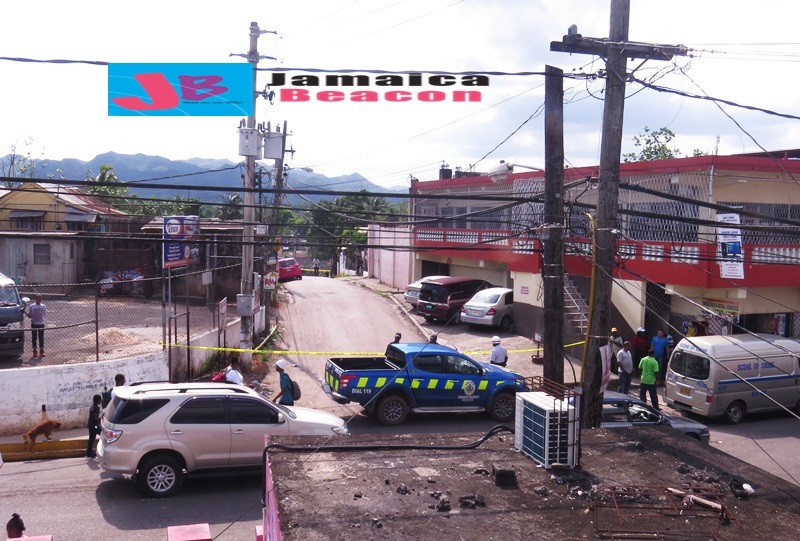 The wounded female, who the JCF said was travelling on foot in the area during the gunfire, received a shot reportedly in the buttocks. 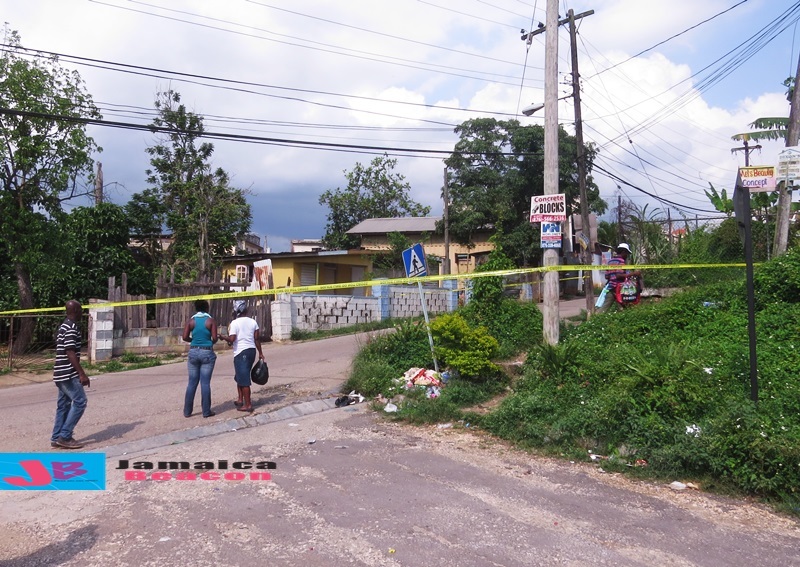 Residents said she is a student of DintHill Technical High School in Linstead. Both wounded persons were taken to hospital. 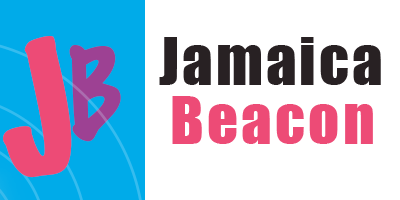 The JCF, through its Corporate Communications Unit, said a gunman rode a bicycle in escaping. On the other hand, residents told The Beacon that a gunman was seen walking away from the crime scene, and wearing a pullover while he escaped in the direction opposite King Street. 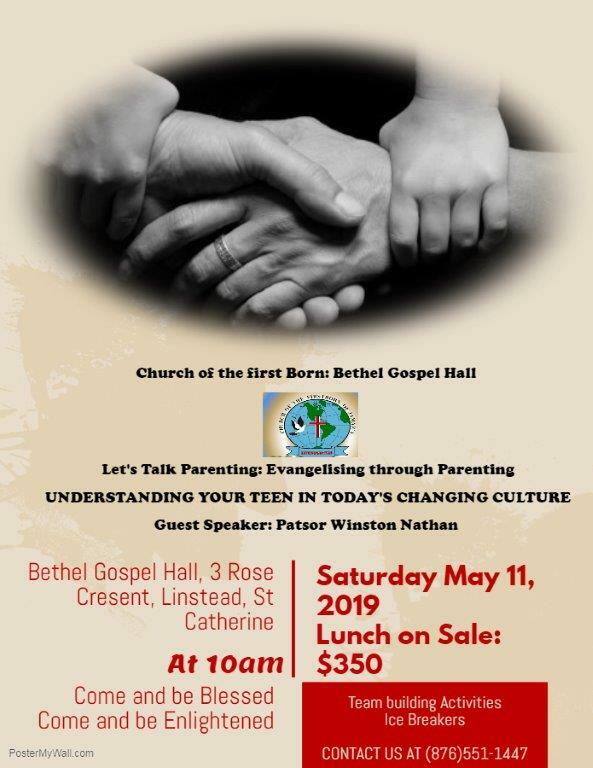 Residents also spent much time talking about the brazenness of shooters, considering that they could easily have been cornered at either ends of the usually busy Fourth Street where the shooting transpired. The incident, in the meantime, sent pedestrians scampering for cover, and resulted in a major pileup of traffic especially on King Street. 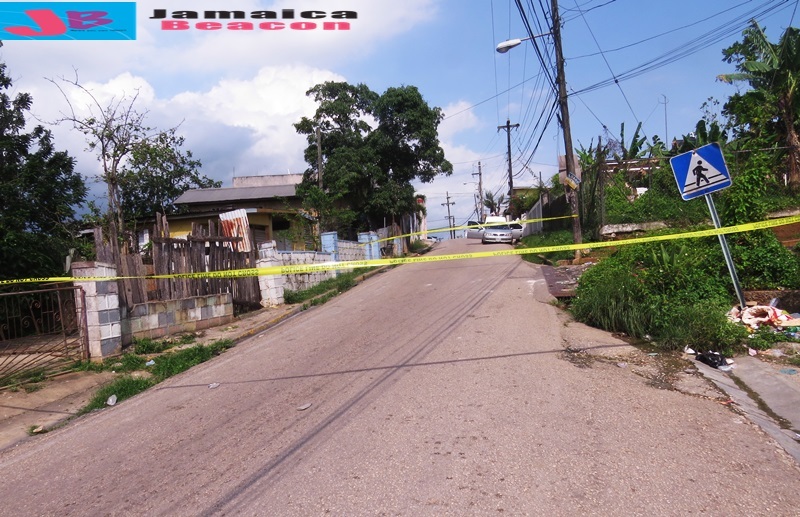 Police officers, up to publication time, were maintaining a presence around the crime scene, which was cordoned off at both ends of Fourth Street.